When deciding on possible holiday destinations, the Mediterranean offers a plethora of options: whether one prefers to relax on a beach, eat delicious food, soak up some culture or engage in some more adventurous activity, holidaymakers are spoilt for choice. One country that might not come up in the average conversation of where to go however, is Albania – which is where my girlfriend, Louise, and I decided to visit earlier this month. When I told my friends that’s where we were going, I did get some strange looks (one because they had confused Albania with Algeria), but I’d done a bit of research and the “Albanian Riviera” sounded like a great place to go. I wasn’t wrong – set between a beach and a dramatic mountain backdrop, Dhërmi is a lazy town where the main activities consist of eating, drinking, sunbathing and swimming. Other than ticking all the boxes for a relaxing beach holiday it was relatively quiet, with the vast majority of other tourists appearing to be Albanians, and in fact the noisiest thing was the cicadas in the olive groves around our bungalow. While I didn’t manage to get a photo of a cicada, I did get some photos of this stunning little insect who hung out in our porch for a couple of days. At first I thought it was a cricket, but while I was trying to identify it I came across this helpful page from the University of Florida, which made me think it might be a katydid – it looks in the photo below that there are 3 segments to the tarsi (at the end of the leg, what one might call a “foot”), which according to the Orthoptera order tree on the linked page defines it as a katydid. After progressing with the key offered on this page and my photos as reference, my best guess is that it is from the subfamily Tettigoniinae (shield-backed katydids), although I haven’t yet found any way to identify the species online. If anyone reading this knows of the species or could suggest a way I might be able to identify it, please comment or leave a message on my Contact page. Alternatively, if you’d rather go and find one for yourself, you can book to stay at Altea Beach Lodges here. 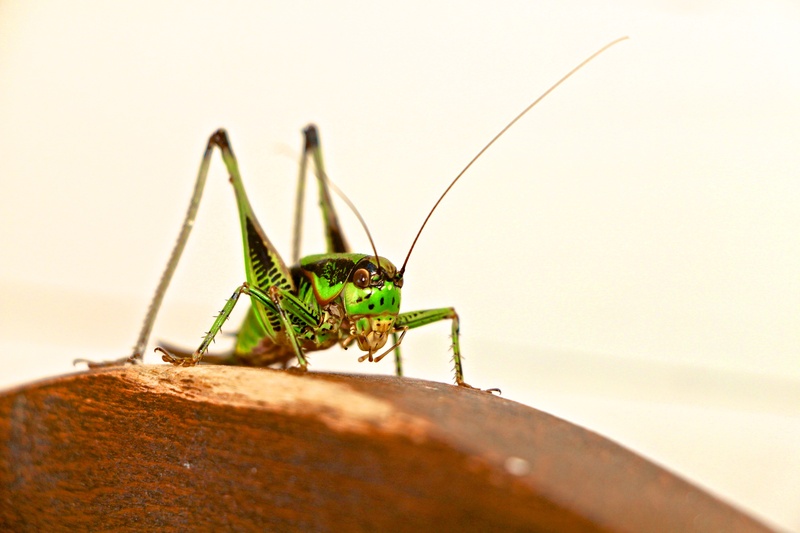 This entry was posted in Blog and tagged Albania, Albanian riviera, Altea Beach Lodges, cricket, Dhermi, katydid, Orthoptera, Tettigoniinae.